Excellent Spas & Recreational Facilities: Royal Caribbean’s ships all have elaborate health club and spa facilities, swimming pools, and large, open sundeck areas, o Activity Central: With rock-climbing walls, surfing machines, zip lines, water parks, basketball courts, miniature golf, ice skating, and bungee trampolines among the many diversions, these ships are tops in the adrenaline department. q Quality Entertainment: Royal Caribbean spends big bucks on entertainment, which includes high-tech show productions. Gargantuan Ships: As with some other big ships, you almost need a map to get around, and you’ll likely experience the inevitable lines for buffets, debarkation, and boarding of buses during shore excursions. Everything takes longer on these jumbo-megas. This bold, brash, innovative company, now in its 45th year, has the largest passenger capacity in the industry on the biggest ships. Royal Caribbean International introduced the concept of the megaship with its Sovereign of the Seas in 1988, and the industry hasn’t been the same since. The mass-market style of cruising that Royal Caribbean sells aboard its megaships is reasonably priced and has nearly every diversion imaginable. 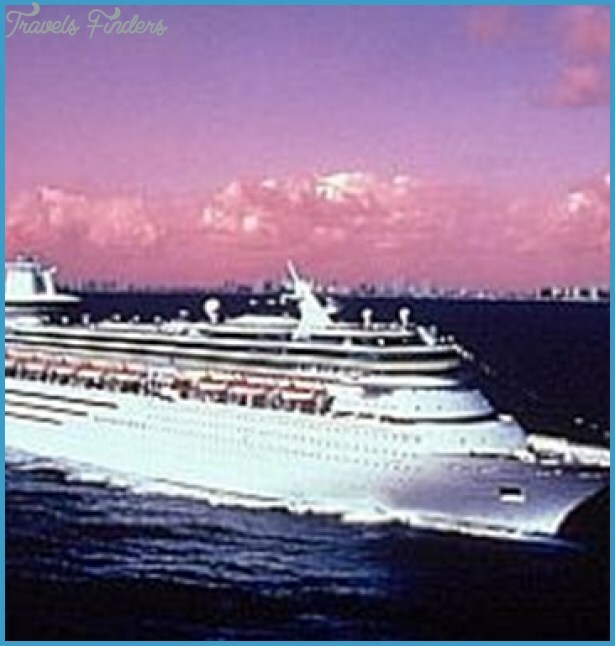 Royal Caribbean International (RCI) was the first company to launch a fleet specializing exclusively in Caribbean ports of call hence the company name. In the late 1980s, it expanded its horizons beyond the Caribbean (hence the International) and now offers cruises in every major cruising region. The line prides itself on being ultra-innovative and cutting edge, pushing the envelope with each new class of ship it builds. If there’s something that’s never been done at sea before, Royal Caribbean will figure out how to do it. The ships are more informal than formal and are well run, with a large team of friendly service employees paying close attention to day-to-day details. Dress is casual during the day and informal Most evenings, with two formal nights on a typical seven-night cruise. The contemporary decor on Royal Caribbean vessels doesn’t bang you over the head with glitz like, say, the Carnival line; it’s more subdued, classy, and witty, with lots of glass, greenery, and art. All the Royal Caribbean vessels feature the line’s trademark Viking Crown Lounge, an observation area located in a circular glass structure on the upper deck (in some cases, encircling the smokestack). Another popular trademark feature is the ships’ nautically themed Schooner bars. The range of what’s available on different Royal Caribbean ships varies dramatically depending on age, size, and design, so if a certain feature is important to you, it’s best to double-check the company’s website, brochure, or ask your travel agent first. You’ll find Royal Caribbean vessels across the globe. In the Caribbean, Bahamas and Bermuda yes, but also traversing the Panama Canal, sailing to the Hawaiian isles, the Pacific Northwest and Alaska. And there are other choices as well, including New England, Europe, and, for anyone wanting more exotic itineraries, Dubai in the United Arab Emirates, South America, Asia, Australia and New Zealand, and the South Pacific. The crowd on Royal Caribbean ships represents a wide range of people from all walks of life. You’ll find a mix from ages 30 to 60, with a large number of families during school vacation periods. Unlike Carnival (which draws a mostly American audience), don’t be surprised to see a handful of European or Asian travelers on Royal Caribbean, thanks to the broad worldwide appeal of the company’s newsworthy ships. Food on Royal Caribbean has also been improved in recent years, and occasionally a dish will knock your socks off (though not as much as at the pay-for-play onboard restaurants; see below). Every menu contains selections designed for low-fat, low-cholesterol, and low-salt dining, as well as vegetarian and children’s dishes. A basic menu is available from room service 24 hours a day, and during normal dinner hours, a cabin steward can bring you anything being served in the dining room that night. The line levies a cover charge of $20 to $30 per person for most specialty restaurants, but in our experience the food soars above what’s served in the dining room You’ll find everything from a diner with burgers (the Johnny Rocket’s chain restaurant) to Chop’s Grille Steakhouse and even a Mystery Dinner Theater on some ships. On the activity front, Royal Caribbean sets the industry standard. Newer ships have everything from carousels to ice skating rinks and bumper cars, as well as crazy-cool things like sky diving simulators and surfing simulators. Of course, the line also has plenty of the standard fare across the fleet, from crafts classes to horse racing, bingo, shuffleboard, deck games, line dancing lessons, wine-and-cheese tasting courses, cooking demonstrations, and art auctions. Some of these will carry an extra fee. Activity. Port lectures are given on topics such as Alaska wildlife, history, and culture. The ships also have an extensive fitness program called Vitality at Sea, which includes plenty of different (and sometimes extra-cost) ways for guests to stay in shape at sea, from one-on-one training to organized yoga, spinning and other fitness classes. Children’s activities are the most extensive afloat and include a teen disco, children’s play areas, and the Adventure Ocean and teen programs, which have a full schedule of scavenger hunts, arts-and-crafts sessions, and science presentations so many activities, in fact, that kids get their own daily activities programs delivered to their cabins. Royal Caribbean also provides teen-only spaces on board every ship in its fleet. On some ships, you’ll also find a Royal Babies and Tots nursery, designed by Fisher-Price and Crayola, for youngsters 6 to 36 months of age and up (for a fee of $8 per hour per child). 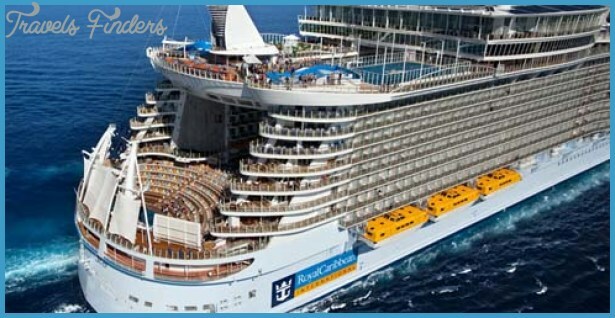 It’s a fantastic program; one that sets Royal Caribbean apart from its competitors. Royal Caribbean’s entertainment package, which incorporates sprawling, high-tech cabaret stages into each of its ships’ show rooms, some with a wall of video monitors to augment live performances, is as good as any other mainstream line. Entertainment begins before dinner and continues late, late into the night. There are musical acts, comedy acts, sock hops, toga parties, talent shows, and that great cruise favorite, karaoke. The Vegas-style shows are filled with all the razzle-dazzle guests have come to expect, and these large-cast revues are among the best you’ll find on any ship. Royal Caribbean uses 10-piece bands in its main showroom Show bands and other lounge acts keep the music playing all over the ships. Overall, service in the restaurants and cabins is friendly, accommodating, and efficient. You’re likely to be greeted with a smile by someone polishing the brass in a stairwell. That said, big, bustling ships like Royal Caribbean’s are no strangers to crowds and lines, and harried servers may not be able to get to you exactly when you’d like them to. Considering the vast armies of personnel required to maintain a line as large as Royal Caribbean, it’s a miracle that staffers appear as motivated and enthusiastic as they do. Laundry and dry-cleaning services are available on both the ships, but neither has a self-service laundromat. Royal Caribbean automatically adds daily gratuities in folios of passengers who have not prepaid gratuities prior to boarding, although passengers can modify these payments at any time during the sailing. The line’s recommended daily gratuities breakdown is $13.50 per person, per day for guests in standard staterooms; and $16.50 per person, per day for suite guests. Pre- and post-cruise hotel stays in Anchorage (from $233 per person double, including transfers) and Vancouver (from $193 per person double, including transfers). 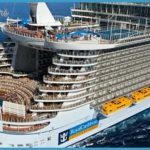 Royal Caribbean owns most of the largest ships in the world, including the recently introduced Harmony of the Seas and her sister ships Oasis of the Seas and Allure of the Seas the world’s largest vessels at 225,282 gross registered tons. 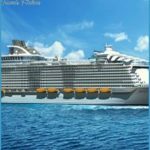 But while Oasis and Allure have room for 5,400 passengers at double occupancy and several other Royal Caribbean ships can hold nearly 4,000, other vessels can only carry around 2,000 passengers. Quantum of the Seas – Anthem of the Seas – Ovation of the Seas From robot bartenders to some of the most elaborate performances at sea, this technologically advanced trio supply ‘wow experiences. Billed by Royal Caribbean as the most technologically advanced ship ever, the 4,180-guest Quantum of the Seas certainly lived up to the hype when she was introduced in late 2014. The boat boasted a high number of firsts, from the robotic bartenders at the Bionic Bar to the RipCord by iFly skydiving simulator, the NorthStar hydraulic observation platform, and the onboard bumper-car arena. Are these things necessary? Well, they’re fun for sure but you probably wouldn’t miss them if they weren’t there. Instead, the standout quality of Quantum and her sisters is how they provide a lot of class at reasonable, mainstream prices. The forward-facing Solarium, with its soaring, two-story glass canopy roof, is a beautifully serene space, and the Windjammer Cafe makes even passing through the buffet a pleasant experience. Cabins There are 2,091 staterooms on these ships, and miles of endless corridors to match. Here’s a little trick to navigating the hallways: Cabins with a 1 or a 2 after the deck number are always on the port, or left, side of the ship; cabins on the starboard side always have a 5 or a 6 after the deck number. Royal Caribbean’s new take on the traditional inside stateroom is the Virtual Balcony Stateroom, inside of which you’ll find a real-time view of outside projected onto one of the walls. Outside Staterooms deliver ocean views through attractive, oversized portholes. To get real, as opposed to virtual, outside access, guests can opt for Balcony Staterooms or Suites. The latter are really something to write home about, ranging in size from big to positively gargantuan. There are 15 different types, from Junior Suites (276 square feet) with an oversized corner balcony, to the massive 1,640-square footRoyal Loft Suites that are spread out over two levels and feature one Bedroom, two bathrooms, a media room, a bar, and a balcony with its own whirlpool tub. Decor across the boards is more modern and upscale than Royal Caribbean’s past vessels, with spiral grey-and-navy blue carpeting, cream-colored drapes, slate-grey bed skirts and runners, and cabinetry accented with coffee edges and blonde doors and paneling. Bathrooms feature much-improved lighting, along with stand-up showers that better mimic those found in hotels and move away from the standard, plastic cylinder found on older ships. In 2016, Royal Caribbean rolled out its new Royal Suite Class aboard these ships. Offering three levels of service (Star, Sky, and Sea) defined by your suite category, they include meals at a restaurant for suite guests only ( Coastal Kitchen ), unlimited Internet access, priority FlowRider rides, exclusive beach access at Labadee (Royal Caribbean’s private enclave in Haiti) and other perks. A total of 34 staterooms are designated as wheelchair accessible. Public areas & activities Most of the public spaces aboard these ships are linked by an oversized, three-deck-high corridor running down the center of the ship. Known as the Royal Esplanade, it connects many popular spots. Royal Caribbean’s past guests will no doubt be happy to see traditional staples like the Latin-themed Bolero’s lounge, with its live salsa music and locally inspired cocktails. But the emphasis is mostly on cool new stuff here. At the Bionic Bar, you can pull up a chair to watch robotic bartenders whip you up an adult beverage. It’s gimmicky and the cocktails aren’t always the most balanced concoctions but it is a compelling show. More to our taste is Vintages, one of the most inviting spots onboard, with its dark wood paneling, sepia-toned artwork, and chocolate-and-creamleather-backed chairs. At the bow, the two-story Royal Theatre hosts high-quality productions, but it’s often overshadowed by its counterpart at the stern. Two70 has a two-story wall of windows overlooking the ship’s wake and seating areas spread over multiple tiers in a classic dinner-theater layout. But it’s the shows that stand out original and developed expressly for these ships, they make use of that back wall of windows, which transforms into a digital canvas by night. Add in smoke and lighting effects and a dynamic soundtrack, and you’ve got an often thrilling spectacle. The casino on these ships is positively massive, taking up the better part of Deck 3 (aboard Quantum, it’s even bigger). Anthem and Ovation have Music Hall, where the menus are made out of pieces of old vinyl records and the cocktails stay in keeping with the same theme. As in some underground club in New York, the place has live performances, two bars, pool tables, and lots of cool velvety furniture. Pool, spa and fitness facilities on these ships are second-to-none, with a mind-boggling variety. The SeaPlex on Deck 14 offers the most unique diversions, from actual bumper cars to a circus school. It also has a full-sized basketball court, roller skating, table tennis, and other games. It’s surrounded by an arcade, a jogging track, and a rock-climbing wall. Up one deck the RipCord by iFly walks you through a full-blown skydiving simulator in a glass-enclosed tube with high-powered fans. The Flowrider, meanwhile, simulates surfing (both simulators tend to draw crowds, so be prepared for an audience if you try them out). Another unique attraction is the NorthStar, a glass capsule perched atop a hydraulic arm that can swing out over the ocean, offering views over 300 feet above the water. So far, rides are complimentary, though Royal Caribbean plans to start charging for it on Ovation when she heads to China. Middle of Deck 14, adjacent to the ship’s oversized movie screen. Forward of this is an indoor pool and the Solarium, a graceful, multitiered space overlooking the ship’s bow with floor-to-ceiling glass. The views inside are unparalleled. One deck up is the Vitality Spa at Sea, offering up the usual salon and spa services, and, above that, the sprawling fitness center. Dining The usual Royal Caribbean staples are here, from the casual buffet to the extra-fee burgers and shakes at Johnny Rockets. Specialty restaurants Chops Grille, Lzumi, and the Chef’s Table, which have proved popular on other ships, show up here as well. Unfortunately, it’s the main dining experience that’s disappointing. Rather than have a single grand, multistory dining room as in the past, Royal Caribbean opted to go with a series of smaller complimentary restaurants, which RCL announced (as we went to press would all have the same menu, drawn from favorites across the fleet). So we can’t comment on the quality of the fare, but they still won’t work numbers-wise with 4,000 guests or so to accommodate in four rooms that seat about 400 each, you could be in for service inconsistencies and long waits. At the specialty restaurants, on the other hand, you’ll find lots to like despite the extra charges. The most creative among these, Wonderland, pairs imaginative decor (it’s pretty much Alice in Wonderland come to life) and inventive cuisine. Jamie’s Italian Kitchen, created by celebrity chef Jamie Oliver, has tasty dishes like lamb lollipops and aubergine parmigiana; designed with the same cool factor as Oliver’s land-based eateries, it’s one of the hardest venues to get into each night (the fees: $20/lunch, $30/dinner). The best of the bunch might be Michael’s Genuine Pub, created in conjunction with James Beard Award-winning chef Michael Schwartz. Mimicking an Irish gastropub, it includes a huge selection of craft beers and a superb selection of a la carte pub favorites like slow-roasted pork sliders and mouth-watering charcuterie boards. Wide-open, all-encompassing views from public and private spaces alike, and they’re made even better by architecture that favors curving lines to lead the eye from one stunning visual to the next. Harmony of the Seas entered service in 2016 and introduced some new features found aboard Royal Caribbean’s Quantum-class ships, but for the most part, these vessels are identical. Cabins One of the more remarkable things about the Oasis ships is that their split-superstructure design allows staterooms to have views inward as well as outward, allowing units that would otherwise have been windowless interior cabins to sport balconies looking out over either the greenery of Central Park or the nighttime excitement of Boardwalk. The 254 balcony staterooms and 7 0 window-view staterooms that flank Central Park are by far the most serene, with pleasant greenery below and a shifting skyscape above. The 225 balcony cabins and eight window cabins that flank the Boardwalk entertainment space are much more boisterous. There are also 18 window-view cabins facing the interior Royal Promenade, but they seem more of an afterthought, and their bay-window views of the street below seem almost claustrophobic by comparison. Standard interior staterooms, without windows of any kind, are available, and run 149 square feet. All staterooms have interactive TVs (through which you can book shore excursions). There are 13 different categories of suites on Oasis-class ships, starting with 287-square-foot Junior Suites and reaching to the 27 Loft Suites at the very top of the ship near the Viking Crown Lounge. These units are true showstoppers, with two floors, two baths, and balconies with sweeping sea views. At the top of the stairs, the loft bedroom floats like a dream behind transparent glass panels that afford open views through the main floor-to-ceiling windows. All suites, loft or not, offer perks like priority check-in, a dedicated suite attendant, coffee and tea service, bathrobes for onboard use, and additional bathroom amenities. A total of 46 staterooms aboard each ship are wheelchair accessible. Public areas & activities Public areas aboard Oasis, Allure, and Harmony are generally grouped into four themed neighborhoods. Our favorite is Central Park, the 21,000-square-foot, open-air tropical garden that sits in the gap between the ships’ split superstructure. Taking up the better part of Deck 8, it has a sophisticated yet bucolic atmosphere, with a wide, tiled pathway undulating through the garden, rising and falling in gentle slopes, flanked by cute red benches and surrounded by garden beds, seating nooks, a sculpture garden, and a number of restaurants and other venues. The parks each contain about 12,000 individual trees, plants, vines, and flowers, all contained within 2,200 individually sized aluminum modules which are in turn housed within 46 large planter beds. Two immense Living Walls covered in vines and flowers stand in the center of the park. Entering from the stern, you first pass the Rising Tide bar, which connects to the Royal Promenade below. Paths lead to either side of the glass enclosure that shelters the bar from weather, and restaurants sit to either side. Moving forward, we pass the open-air, glass-topped Trellis Bar, which seats just 17 people between planter boxes full of greenery on one side and one of the five-deck-high Living Walls on the other. Continuing our walk forward, we arrive at one of two enormous Crystal Canopy skylights that let natural light pass through to the Royal Promenade below. Beyond that is the park’s central square (which is actually round), a sort of communal meeting spot. At the forward end there are shops. The Vintages wine bar sits across from this commercial cluster. The Royal Promenade can be found three levels below Central Park. This all-purpose space houses a number of pleasant drinking spots, shops, cafes, and clubs along its length. Additionally, a parade of Costumed characters and stilt-walkers wanders through each night, and there are places for bands to perform At street level, you’ll pass Bolero’s, a Latin-themed bar that’s been a staple aboard Royal Caribbean ships for years, and the On-Air Club, another old standby that’s been expanded here into a full-service sports bar with a news ticker outside. You’ll also stroll past shops and watering holes including the Brit-style Globe and Atlas Pub, the Champagne Bar, and the quieter Schooner Bar on the mezzanine level. There are a number of casual dining spots and the little Cupcake Cupboard serving fancy, cream-heavy treats for an extra charge. Toward the stern end of the promenade, the oval Rising Tide bar shuttles continually up and down between the promenade and Central Park. Harmony of the Seas adds the robot-staffed Bionic Bar found aboard RCI’s Quantum and Anthem oj the Seas. Along with Central Park, the other open-air neighborhood is the Boardwalk. Stretching for almost a third of the ship’s length on Deck 6, this is a family entertainment zone with a carnival mood. Flanked by the Boardwalk Donut Shop (free donuts!) and Ice Cream Parlor (extra cost) is a carousel with intricate, hand-carved wooden animals. The first traditional merry-go-round at sea, it’s designed to compensate for a ship’s pitch and roll. Throughout the Boardwalk, various permanent and temporary amusements keep things lively. Near the carousel is a classic photo booth where you and your closest can mug to your heart’s content. The space also hosts a daily Family Festival with face-painting and games. Three restaurants offer casual fare, and the Aqua Theater offers swimming in the largest and deepest freshwater pool at sea during the day and impressive aquatic performances at night. Traditional entertainment spaces can be found at Deck 4’s Entertainment Place, which features a jazz club, comedy club, and disco, as well as the ship’s huge casino. This is also the location of Studio B ice rink, for open skating and elaborate ice shows, and the main theater. Note that some shows at various venues require timed albeit free tickets, which you can book through your cabin’s interactive TV. The Youth Zone for children is one of the best in the business, stretching over an amazing 28,700 square feet, with a central boulevard connecting 10 different areas. They include the Adventure Ocean Theater, where kids can put on shows; Imagination Studio, an art-oriented space created in collaboration with Crayola; the Adventure Science Lab, where kids can make DNA strands out of licorice and learn about dinosaurs; and three play spaces segmented by age group. Lastly, there’s the Royal Babies & Royal Tots nursery, a real rarity in cruise land. Open daily, the nursery provides child-care drop-off options both day and night, charging $8 per hour and caring for little ones between 6 months and 3 years. Teen spaces are located one deck above, and comprise a disco, arcade, and lounge with computer stations and activities like Scratch DJ classes. On one of the top decks, the H20 Zone water park is full of water-spouting sculptures, sprayers, and water cannons. Unlike any other pool deck at sea, the ones here are split into four sections, with the deep canyon that houses Central Park splitting them lengthwise and a large structural bridge quartering them at midships. In addition to the H20 Zone, there’s a main pool, sports pool, and beach pool, where the seating area slopes right into the water, letting guests wade in or just park their lounge chairs in the shallow end and dangle their toes in the water. Behind the pool zone is where Royal Caribbean keeps some of its best toys including a miniature golf course and basketball court, while an elevated platform across the back of the deck holds two FlowRider Surfing Simulators and the launch pad for the only zip lines at sea, which allow guests to Fly across the chasm that houses Boardwalk, a full nine stories below. The ride takes all of about 7 seconds, but it’s a rush. Each of the ships’ valuable top-deck real estate is occupied by the best Solarium at sea, a two-deck-high wonder under a curved canopy with open strips to let in the air and a bistro that transforms into a disco at night. A riverlike water feature separates seating into various islands on the main level, which also has a small pool and two whirlpools. To both port and starboard, between the Solarium and the main Pool Deck, two cantilevered whirlpools sit within domed, semi-open bubbles jutting out over the sides of the ship, 136 feet above the ocean. Dining Both Oasis and Allure have a gorgeous three-level dining room that can seat more than 3,000 guests at a time. But what distinguishes these ships from their fleetmates is the number of specialty restaurants and casual dining spots on board. Central Park, for instance, has two casual restaurants and two fine-dining establishments. On the casual side, Giovanni’s Table ($15 per person at dinner, $10 at lunch) is a family-style Italian restaurant serving pizzas, pastas, and various rustic dishes, while the Park Cafe (free) is sort of an adjunct to the traditional buffet restaurant upstairs, serving made-to-order salads, panini sandwiches, soups, and the like. On the fancy side, Chicago-style steakhouse Chops Grill seats guests both inside and out on its alfresco patio ($25 per person). 150 Central Park is the fanciest restaurant on board, specializing in six- to eight-course tasting menus with wine pairings ($35 per person) all overseen by award-winning resident chef Keriann \bn Raesfeld. Both Chops and 150 Central Park are open for dinner only. Boardwalk has three casual eateries: the Seafood Shack (lunch $7.95 cover, dinner $9.95), the ’50s-style Johnny Rockets (breakfast $3.95, lunch and dinner $4.95), and the Boardwalk Bar. Down on the Royal Promenade, there’s a serviceable Sorrento’s Pizza and Cafe Promenade for light meals. There’s also a 24-hour coffee, pastry, and sandwich stand called the Mondo Cafe. Freedom of the Seas – Independence of the Seas – Liberty of the Seas Supersize versions of the already supersize Voyager-class ships, Freedom, Liberty, and Independence of the Sects offer everything those ships have and more though they come close to being too commercial for their own good. The second-largest class of cruise ships in the world, after Royal’s own Oasis boats, these three vessels are, in essence, bigger versions of Royal Caribbean’s popular \byager-class ships, which introduced the line’s now-brandwide active vacation image, complete with rock-climbing walls, ice-skating rinks, and full-size basketball courts. The Freedom ships also boast some unique features, namely a kids’ water park and a surfing simulator. Extremely well designed, the Freedom vessels disperse their large complement of passengers among many public areas including the four-story, boulevard-like interior Royal Promenade, which runs more than a football field’s length down the center of each ship and is lined with bars, shops, and entertainment lounges. The promenade, with its urban feel, makes the Freedom vessels a great compromise for couples who can’t decide between a cruise and a land-based vacation. They really do feel like cities at sea. Freedom ships have a nearly identical layout and ambience to Voyager craft, but they carry at least 500 more passengers and things are a bit more stretched out, with a few new eye-catching activities and entertainment features. One drawback to that extra space: the Freedom ships’ Royal Promenade has a lot more shops and corporate cobranding arrangements (a Ben & Jerry’s ice-cream parlor, a sportswear shop with a dedicated New Balance section, and so on), making it feel like a mall as much as a ship. A series of refits in 2011 and 2015-16 added a number of new features, including nurseries for babies, big video screens by the main pools, helpful new digital signage to help you get around, and specialty cupcake shops along with new staterooms. The strange nightclub The Crypt disappeared to make way for those, and the jogging track has been done away with, too. Cabins Standard outside cabins are a livable if not exactly large 161 square feet, though standard insides seem small at 152 square feet. Bathrooms are on the cramped side, with little storage space, few amenities (soap and shampoo only), and only a thin sliver of counter. The cylindrical shower stalls have RCI’s standard sliding doors that keep in the water and warmth. Of 1,815 cabins, more than 1,000 have ocean views and 844 have verandas; all have a pleasant, pastel color scheme. Suites range from the affordable junior suites (with sitting area and balcony) to a handful of family suites (with two bedrooms, two bathrooms, and a living area with sofa bed) up to the huge Presidential Suite with its four bedrooms, four bathrooms, and 810-square-foot balcony. For those who want to spend a lot of time people watching, the 168 atrium cabins on the second, third, and fourth levels of the four-story Royal Promenade have windows facing the action below, with curtains and soundproofing to keep most of the light and noise out when you’re ready for some downtime. Thirty-two cabins are wheelchair accessible. Public areas & activities These ships have more than 3 miles of public corridors apiece, and it can feel like a real hike if your cabin is on one end of the ship and you have to get to the other. As for what’s onboard where do we start? Small bookstore, and for our money, the best thing on the whole strip a men’s barbershop giving old-timey professional shaves spiced with a helping of New Age spa frippery. The half-hour Express Shave includes hot towels, deep-cleansing exfoliation, a superclose shave, and did we mention hot towels? The only inauthentic touch: They use safety razors instead of straight. There’s a huge multistory theater, a casino with more than 300 slot machines, a Latin-themed bar with live music, a wedding chapel, a peek-a-boo bridge where guests can watch the crew steer the ship, and an ice rink (for skating and shows held both on the ice and on a sliding floor that covers it). For younger passengers there’s a sprawling kids’ area with an oceanview playroom, and a teen center. 30,000 gallons per minute up the slope, creating a wavelike flow on which boarders can ride. At least in theory. The ride is adjoined by bleachers for gawkers and fans who come here expressly to watch people wipe out and most everyone does. Also nearby: Royal Caribbean’s signature rock-climbing wall (the biggest one at sea), a mini-golf course, golf simulator, jogging track, and basketball court. In the ship’s gym, a 20-by-20-feet boxing ring takes the place of the large hot tub that greets guests on Voyager ships. The ring is part of what the line bills as the largest fitness center at sea, with an enormous number of aerobics and weight machines plus workouts (for a fee) that are rare even in shore-side gyms. Options include Fight Klub training (one-on-one boxing sessions), personal training with Pilates instructors, yoga, and a class on the beach at Labadee, Royal Caribbean’s private resort in Haiti. A program of mapped jogging routes is available in the ports of call. Back outside, the kid-friendly H20 Zone Water Park takes up almost half the pool deck, with water cannons, jets, buckets, and sprays hidden among colorful cartoon statues, some controlled by motion sensors, others by the kids themselves. The area also includes two wading pools (one geared to toddlers) and two hot tubs for parental relaxation. Farther forward, the main pool area has two pools and two large hot tubs extending 12 feet over the edge of the ship and some 112 feet above the sea. Extremely popular, they get crowded early. Guests seeking something more peaceful can sometimes find it in the adjacent, adults-only Solarium, where a second swimming pool is bisected by a little bridge. Waterslide aficionados have good reason to choose Liberty of the Seas over her sisters: In January 2016, the ship received three brand-new slides, including two racers known as Typhoon and Cyclone, and Tidal Wave the first boomerang-style waterslide at sea. Dining The ships’ three-level main dining rooms are, like those on RCI’s \byager-class ships, among the classiest on any of today’s megaships. Each level linked by a large open area and grand staircase at its center is considered a separate restaurant, though service and menus are consistent throughout. A pianist or trio entertains from a platform in the aft end of the room and a huge crystal chandelier hangs overhead, setting an elegant mood. Chops Grille offers steaks ($39 and up depending on what’s ordered). Out in the buffet, a section called Jade serves Japanese, Chinese, Indian, and Thai dishes. Another casual spot for lunch, dinner, and late-night snacks is the popular Johnny Rockets, a 19508-style diner ($6.95 meals, extra for shakes and sodas). 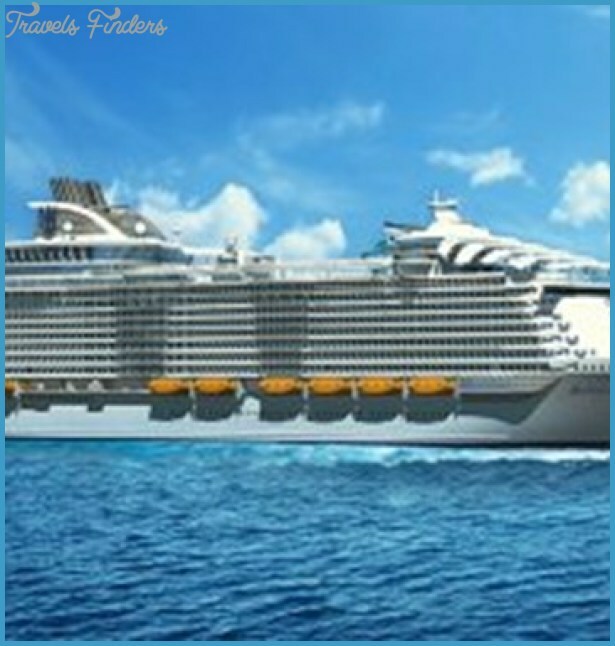 Voyager of the Seas – Explorer of the Seas – Adventure of the Seas – Navigator of the Seas – Mariner of the Seas Sports club meets Vegas meets theme park meets cruise ship: These enormous vessels are for those who like their vacations larger than life. Truly groundbreaking when they were first launched, \byager-class ships are still among the largest and most activity-rich passenger ships at sea. And though each vessel carries 3,114 guests at double occupancy (because many staterooms have third and fourth berths, total capacity can reach as high as 3,838), remarkably, the ships rarely feel as crowded as you’d expect. Kudos go to the crew for efficiency, and also to Royal Caribbean for a design that diffuses crowds comfortably. This design not only keeps traffic moving, but it also means you don’t tend to find yourself in the same spots day after day it’s entirely possible to be aboard for 6 days, turn a corner, and find yourself in a room you’ve never seen before. One thing that deserves mention about ships this large is that even though ongoing maintenance is standard (replacing stained upholstery or carpeting, for instance), it’s tough keeping up with the demands of constant use by thousands of passengers, especially on the ship’s soft goods. On one sailing aboard the Voyager, for instance, we noticed a torn curtain in the dining room and soiled fabric on some chairs. Royal Caribbean recently committed to a massive refurbishment program on these vessels, which should help and which has already added new features to Explorer of the Seas and Navigator of the Seas, such as updated stateroom decor and amenities (hello, flat-screen TVs! ), along with FlowRider surfing simulators and new dining venues like Chops Grille and Izumi. Ships are also getting oversized poolside LED movie screens slowly but surely, with Adventure of the Seas being the latest scheduled to undergo the refits by the time you read this. Sliding doors that keep in the water and warmth. Of the 1,557 cabins, 939 have ocean views and 757 have verandas. There’s a single huge Penthouse Suite, 10 Owner’s Suites, and four Royal Family Suites that accommodate a total of eight people with two bedrooms, plus a living room with sofa bed and a pair of bathrooms. Smaller and cheaper family cabins sleep six, some on sofa beds. The 138 atrium cabins on the second, third, and fourth levels of the four-story Royal Promenade have windows facing the action below; curtains and soundproofing keep most of the light and noise out when you want some peace and quiet. Twenty-six cabins are wheelchair accessible. Public areas & activities Expect non-stop action on all three ships. Each boasts a full-size ice-skating rink; an outdoor in-line skating track; a 9-hole miniature-golf course and golf simulator; regulation-size basketball, paddleball, and volleyball courts; huge two-level gyms and spas; and the rock-climbing walls that have become one of Royal Caribbean’s most distinguishing features. And did we mention they also have monumentally gorgeous, three-story dining rooms, florist shops, and a peek-a-boo bridge on Deck 11 that allows guests to watch the crew steering the ship? There are also huge kids’ areas with sprawling oceanview playrooms, teen discos, and jumbo arcades. For those of age, there are some 30 watering holes aboard each ship, including the Viking Crown complex on the top deck, with its elegant jazz club and golf-themed 19th Hole bar; the dark, romantic Schooner Bar; and the clubby cigar bar, tucked away behind a dark door and hosting blackjack games on formal evenings. Both tippling and dancing go on in the futuristic, or Gothic-dungeon-themed, disco (it varies by vessel) which is entered through a secret passage. And running down the center of each ship is the bustling, four-story, shop-and-cafe-lined Royal Promenade, which has even more kinds of bars an English/Irish pub, a champagne bar, a raucous sports bar, and Vintages wine bar, on Navigator and Mariner only. Vintages is a collaboration with several notable Napa wineries and showcase more than 60 wines at reasonable prices. Guests can taste any variety before ordering (classes in wine appreciation are also held here). Of course, the fun isn’t all booze-fueled. Voyager, Explorer, and Adventure carry an arcade stocked with classic 1980s video games. Each ship has a two-story library and computer room equipped with webcams that allow you to send your picture as an electronic postcard. Lavish productions entertain each evening in handsome three story showrooms with truly lovely stage curtains the one on Adventure decorated with peacock designs, the one on Explorer depicts a chorus of women standing under golden boughs amid a rain of leaves. While crowds tend to disperse around the ships’ public areas, on sunny days things can get tight out on the main pool decks, where deck chairs are squeezed into every level of the multistoried, amphitheater-like decks. Guests seeking something more peaceful can usually find it in the adjacent Solarium, which has a second swimming pool and two enormous whirlpool tubs under a sliding roof. Behind the Johnny Rockets diner, Voyager, Adventure, and Explorer have a kids’ pool area with a water slide, wading pool, hot tub for adults, and dozens of adorable half-size deck chairs for the kids. On Navigator and Mariner, the area is reserved for teens, with deck chairs for sunbathing and an outdoor dance floor with sound and light systems. And to get to all of this whew! 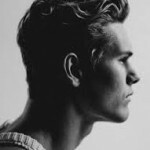 get ready to do some walking. The ship has 3 miles of corridors, so bring comfortable shoes. Dining The three-level main dining rooms on these ships are stunning, with designs that follow a general European theme. Each level linked by a large open area and grand staircase at its center is considered a separate restaurant, though service and menus are consistent throughout. To enhance the elegant mood, pianists tickle the ivories from a platform in the aft end of the room and a huge crystal chandelier hangs overhead. Dining alternatives are many, from Italian food at the oceanview Portofino restaurant (an additional $20 per person) to diner fare at Johnny Rockets ($6.95-per-person service charge; sodas and shakes are a la carte) to Chops Grill and Japanese-themed Lzumi (the last two on Explorer of the Seas and Mariner of the Seas only). The spacious Island Grill and Windjammer casual buffet restaurants are joined into one large space, but have separate lines and stations to keep things moving. On Navigator and Mariner, this area also incorporates the Asian-themed Jade buffet. There’s no outdoor seating per se, but the ship’s main pool area is on the same deck, just outside the restaurants’ entrances. Radiance of the Seas – Brilliance of the Seas – Serenade of the Seas – Jewel of the Seas With their classic nautical profiles and interior decor, these are Royal Caribbean’s most elegantly traditional ships, though they offer a lot of the fun and games of RCI’s larger vessels, including rock climbing and mini golf.These ships are just plain handsome, with some of the adventure features of their larger Oasis-, Freedom-, and Voyager-class siblings, but a sleeker seagoing profile outside and a more nautical look and feel inside and acres of windows to bring the two together. They are of a more manageable size, too. When you first board, you’ll see one of Royal Caribbean’s typical wiry modern art sculptures filling the bright, nine-story atrium, but venture a little farther and you’ll see that the ships have a much more traditional interior, with dark-wood paneling, caramel-brown leather, and deep-sea-blue fabrics and carpeting. Some 110,000 square feet of glass covers about half of their sleek exteriors, affording wide-open views from the many bars, lounges, and eateries. The same goes for the atrium, which is an uninterrupted wall of glass from Decks 5 through 10 portside, and has four banks of glass elevators. All this transparency comes in handy in scenic destinations such as Alaska. Caribbean’s typical hold-your-breath-and-step-in shower stalls but baths do have lots of storage space. All but a handful of suites are located on Deck 10. The best, the Royal Suite, measures 1,001 square feet and has a separate bedroom, living room with baby grand piano, dining table, bar, entertainment center, and 215-square-foot balcony. Six Owner’s Suites are about half that size, with 57-square-foot balconies, a separate living room, a bar, and a walk-in closet. Grand Suites are a step below in size and amenities. Three Royal Family Suites have 140 balconies and two bathrooms and can accommodate six people in two separate bedrooms (one with third and fourth berths, and another two on a pullout couch in the living room). Suite guests are treated to complimentary in-cabin butler service in addition to cabin stewards, and there’s a Concierge Club on Deck 10, where suite guests can request services and grab a newspaper. One snag on the balcony front: On each ship, cabin Decks 7 through 10 are narrower than those on the rest of the ship, resulting in cabin balconies on Deck 10 (many of them suites) being shaded by the overhanging deck above. Meanwhile, cabin balconies on the aft and forward ends of Deck 7, being indented, look out onto the top of Deck 6 instead of directly out onto the sea. Some balconies on Deck 7 aren’t completely private because the dividers between them don’t go all the way to the edge of the space. Keep your clothes on your neighbors can look right over at you. Fifteen cabins on each ship can accommodate wheelchair users. Public areas & activities Our favorite place on board is the grouping of five intimate, wood-and-leather lounges on Deck 6, which recall the decor of classic yachts, university clubs, and cigar lounges. Expect low lighting, inlaid wood flooring, comfy couches, and area rugs. The best of these rooms is the romantic piano bar and lounge that stretches across each ship’s stern and has a bank of floor-to-ceiling windows. Adjacent is a lovely colonial-style Billiard Club boasting herringbone wood floors, redwood veneer paneling, and a pair of ultra-high-tech gyroscopic pool tables. No excuse for missing shots: The tables compensate for the ship’s movements, staying remarkably level. The main theaters are refreshingly different from most in the cruise biz, with a cool ambience, warm wood tones, and seats in deep-sea blues and greens. Artful handmade curtains, indirect lighting, and fiber optics all come together to create a quiet, ethereal look. Other public areas include the attractive Casino Royale, with more than 200 slot machines and dozens of gaming tables; a baseball-themed sports bar with interactive games on the bar top; a specialty coffee bar with several Internet stations; a small library; and, high up on Deck 13, Royal Caribbean’s signature Viking Crown Lounge, which is divided between a quiet area and a large disco with a rotating bar. Even the ships’ high-style public bathrooms are impressive, with their marble floors and mirrors reminiscent of portholes. The huge kids’ area on Deck 12 includes a sprawling playroom divided into several areas, with a video arcade and an outdoor pool with water slide. Teens have their own nightclub, with a DJ booth, music videos, and a soda bar. Adjacent (and popular) pizza counter adds a little pandemonium to the otherwise serene scene (as can kids, if they happen to find the place). The adjacent spa has 13 treatment rooms and a special steam-room complex with heated tiled lounges and showers that simulate tropical rain and fog. The Sports Deck has a 9-hole miniature-golf course and golf simulators, a jogging track, a rock-climbing wall attached to the funnel, and a combo basketball, volleyball, and paddle-tennis court. The oversized oceanview gym has a huge aerobics floor and dozens of exercise machines, including sea-facing treadmills and elliptical stair-steppers. Dining The two-story main dining rooms on all four ships are glamorous and elegant, like something out of a 1930s movie set. Four willowy, silk-covered columns dominate the vaulted main floor, and a wide double staircase connects the two decks dramatically all that’s missing are Cary Grant and Deborah Kerr. On Serenade, painter Frank Troia’s huge, Impressionist Gala Suite amplifies the mood, depicting formally dressed couples dancing amid floating globes of light. The nautically decorated Windjammer Cafe takes self-serve buffet dining to new levels, with 11 food stations (nine inside and two outside) set up as islands to keep the lines down and the crowds diffused. If you prefer taking your meals while reclining, there’s a small strip of cozy tables with oversize rattan chairs and thick cushions between the indoor and outdoor seating areas. The cozy, 90-seat Chops Grille is an oceanview spot with dark woods, rich upholsteries, and high-backed booths that bring home the meat-and-potatoes mood. You can watch your steak being cooked in the open kitchen. Adjacent is the 130-seat Italian eatery Portofino. Expect more refined and gracious service than in the main dining room, plus a more leisurely pace (and a cost: Portofino charges a $20 per person cover charge; for Chops, it’s $25 per person). Up on the Sport Deck, the Seaview Cafe is a serves quick lunches and dinners of fish and chips, popcorn shrimp, burgers and other comfort foods. At a counter in the Solarium freshly made pizza is served by the slice, and a coffee shop serves cappuccino and pastries. 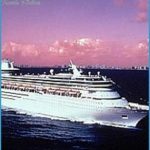 Enchantment of the Seas – Grandeur of the Seas Rhapsody of the Seas – Vision of the Seas Once the latest and greatest, these four are looking frumpy these days, compared to their newer fleetmates. That even the best ships from the late-20th century can seem dated and these do. Still, they each have an open, light-filled feel and many of the same amenities as aboard the line’s newer, larger ships, and to us, their relatively smaller size is a point in their favor. You won’t feel overwhelmed or lost here. All the ships have been retrofitted with crowd pleasers like rock-climbing walls, but Enchantment of the Seas is by far the most modernized of the bunch. In mid-2005, RCI revisited a trend common in the mid-’90s, literally sawing the ship in half like a magician’s assistant, inserting a new 73-foot midsection, and then welding it all back together. As a result, Enchantment offers a lot more than her Vision-class sisters. On the much-enlarged Pool Deck, there’s an additional stage and midships bar for adults and an interactive splash deck with water jets that kids can control to spray each other or create their own water ballet. Additions to the nearby Sports Deck include four bungee trampolines. New accessibility features for passengers with disabilities include pool and Jacuzzi lifts, access to the Splash Deck, a lift to the bungee trampoline area, and improved thresholds and ramps throughout the vessel. There have been below-deck changes, too, such as the addition of a Latin-themed bar, an expanded casino, a larger shopping area, and a new coffee bar features currently available aboard RCI’s newer vessels. Although the refit was a success, it cost a pretty penny. Don’t expect Royal Caribbean to bestow it on Enchantment’s sisters anytime soon. Generally, when these ships are sailing full, things can feel crowded. Getting on and off at ports can also be a hassle with so many people to move. Cabins To put it politely, cabins are compact. Yes, they’re larger than the staterooms on the line’s older Majesty of the Seas, but smaller than those on the Oasis-, Freedom-, and \byager-class ships and on many competitors’ vessels. Still, there’s an impressive amount of storage space. Bathrooms are likewise on the small side, with shower stalls that are a tight squeeze for anyone thicker than a supermodel. Overall, it’s safe to say these accommodations have seen better days though on the bright side, carpeting and bedding are in good shape. For something grander, check out the 1,140-square-foot Royal Suites, which have a baby grand piano and huge marble bathroom with double sinks, a big whirlpool bathtub, and a glass-enclosed shower for two. For something in between, check the roomy, 190-square-foot category-Dl cabins, with private verandas, small sitting areas with pullout couches, and tons of storage space. All told, about a quarter of each ship’s cabins have private verandas, and about a third can accommodate third and fourth passengers. Each vessel has between 14 and 17 staterooms equipped for wheelchair users. Public areas & activities Throughout each vessel, warm woods and brass, gurgling fountains, green foliage, glass, crystal, and buttery leathers highlight the public areas, where the ambience ranges from classic to glitzy to old-fashioned. The bright, wide open, and easy-to-navigate Promenade and Mariner decks are home to most public rooms, their corridors converging at a seven-story atrium where glass elevators take passengers from Deck 4 all the way up to the glass-walled Viking Crown Lounge on Deck 11. Full musical revues are staged in glittery two-story showrooms, where columns obstruct views from some balcony seats. The ship’s casinos are Vegas flashy, with hundreds of gambling stations so densely packed that it’s sometimes difficult to move and always difficult to hear. Better nightlife is found at the Schooner piano bar (a great place for after-dark unwinding) and the Champagne Terrace at the foot of the atrium, where you can sip a glass of fine wine or bubbly while swaying to the two- or three-person band playing there. In contrast to its showcase spaces, each ship also contains many hideaway refuges, including an array of cocktail bars, a card room and a library, though not a very well-stocked one. A couple of thousand original artworks aboard each ship (the good, the bad, and the weird) add a human touch. For kids, there’s a decent playroom stocked with toys, books, and games, and nearby is a roomy teen center and a small video-game arcade. Recent refits have improved lighting in the ship’s atrium, and have added high-energy acrobatic performances in these soaring, multi-story areas. The spas on these ships offer a wide selection of treatments as well as the standard steam rooms and saunas. Adjacent Solarmms have a pool, lounge chairs, floor-to-ceiling windows, and a retractable glass ceiling for inclement weather. Designed after Roman, Egyptian, or Moorish models, these bright, spacious areas are a peaceful place to lounge (except maybe during lunch and pre-dinner hours, when the snack bar in the corner takes away from their serenity). Gyms are surprisingly small and cramped considering the ships’ size. Dining The large dining rooms aboard these vessels span two decks connected with a grand staircase and flanked with 20-foot walls of glass. The rooms are of their era, with lots of stainless steel, mirrors, dramatic chandeliers, and, altogether, the feeling of a ’90s banquet hall. At lunchtime on a recent Rhapsody cruise, the whole operation seemed disorganized there was a long wait for tables and waiters seemed hassled to keep up. There’s also a large indoor/outdoor buffet restaurant serving breakfast, lunch, and dinner. Again, on a recent Rhapsody sailing, the Windjammer buffet was a chaotic sea of humanity during lunchtime; it was hard to find a seat and crew seemed to struggle keeping things tidy and bins filled. A small snack counter where pizza, sandwiches, and various salads are served can be a welcome respite from the frenetic Windjammer buffet at lunchtime. Majesty of the Seas She’s no spring chicken, but she sure is a bargain, sailing inexpensive 3- and 4-night cruises to the Caribbean and the Bahamas from Florida. Sail for Spain’s Pullmantur Cruises), Majesty of the Seas was once among the largest cruise ships in the world. Today, she’s literally less than half the size of her largest fleetmates. A decade and a half of hard use has imparted her fair share of bumps and bruises, and even though recent makeovers have hammered out some of the dents and updated the ship’s overall look, passengers should expect a well-worn look rather than a sophisticated one. 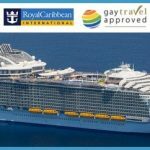 A mid-2016 refit added some fun new features, but if you want to sail aboard this classic ship, do it now: Rumor has it Majesty is scheduled to transfer out of the Royal Caribbean fleet sometime in 2018. Cabins Standard staterooms are very snug at only 120 square feet, bathrooms are similarly cramped, and closet space is limited. More than 100 cabins have upper and lower berths to accommodate four, albeit very tightly. Overall, decor is spartan and uninspired, with pastel fabrics and blond woods, and like other ships of this generation, relatively few rooms have balconies. Additionally, the soundproofing isn’t the greatest; in some cabins you can hear every word your neighbors say. Four cabins can accommodate wheelchair users. Public areas & activities A dramatic five-story atrium is the focal point of the ship, separating the public areas (which are mostly clustered in the stern) from the cabins forward, an arrangement that minimizes bleed-through noise and also gives the impression that Majesty is smaller than she is. Shops, the ship’s salon, the Internet center, the library, several information desks, and a champagne bar are all clustered around the atrium at various levels. Elsewhere, you’ll find a giant casino, a cinema, the popular Schooner Bar, and (as on all pre- Voyager RCI ships) the Viking Crown Lounge, perched on the topmost deck some 150 feet above sea level and with nifty panoramic views. It’s a great place for a pre-dinner drink and after-dinner dancing. Down on Decks 5 and 7, the two-story main show lounge is roomy and well planned, with lots of cocktail tables for two and a huge stage. As part of her makeover in recent years, Majesty has been fitted with a Boleros Latin Lounge, a dueling-pianos act, and drinks from Brazil, Cuba, and Central America. The ships’ children’s centers were also expanded and three teens-only hangouts added: the Living Room coffee bar, a disco called Fuel, and a private outdoor Sun Deck with a dance floor. A 2016 refit added even more features, including a massive poolside movie screen mounted just beneath the Viking Crown Lounge, and the line’s new Voomhigh-speed Internet. The deck layout and two good-size swimming pools seem plenty spacious when they’re empty, but the number of passengers who typically sail these short itineraries almost guarantees that they’ll fill up with wall-to-wall passengers. That said, there are many patches of more isolated deck space, from the quiet slices on the tiered aft decks to two levels of far-forward deck space. The Sports Deck, up high in the stern, has Ping-Pong tables and a basketball court. The half-moonshaped gym on Deck 10 is fairly spacious, with a wall of windows facing aft. Treadmills, stationary bikes, step machines, and free weights line the perimeter of the room, facing the sea, and the inner part of the room serves as the aerobics space. A smallish spa is adjacent. Majesty also sports Royal Caribbean’s signature rock-climbing wall. Dedicated pizzeria or grab a specialty coffee or a Ben & Jerry’s ice cream from the Latte-tudes coffee shop. And as is now standard on Royal Caribbean, the ship features a ’50s-style Johnny Rockets diner serving burgers and shakes (with a $6.95 cover charge). Empress of the Seas This ship offers a healthy dose of mid-1990s cruising nostalgia, but is a good match for the budget-conscious and those turned off by the line’s larger ships. Empress of the Seas is back in the Royal Caribbean fleet after a nearly decade-long absence (when she was in the service of Pullmantur). Originally the line’s Nordic Empress before being renamed Empress of the Seas in 2004, this cozy ship was one of the first to be purpose-built for three-and-four day cruises. It’s no stretch to suppose that Royal Caribbean brought her back for one purpose: to eventually operate quick cruises to Cuba from Miami. That hasn’t happened yet but it’s a tantalizing thought. Like Majesty of the Seas, Empress is no spring chicken, and fans of the technological doodads aboard the line’s Quantum- and Oasis-class ships will be disappointed. But for budgeteers, Empress is a fine choice for a quick jaunt to the Bahamas. With just 1,602 guests onboard, she’s the smallest ship in the Royal Caribbean fleet, with a length of 692 feet. Cabins A total of 801 cabins are onboard, and nothing says I love the ’90s like the fact that just 69 of these, most of which were added during the ship’s Pullmantur days, have private balconies. On the subject of interior staterooms, the Royal Caribbean website says, Spend your days onboard by the pool or on our sports deck. Then relax at night in the comfort of your interior stateroom Which is a subtle way of saying these rooms are teeny-tiny. Standard interior staterooms start at just 109 square feet only 9 square feet larger than studio accommodations aboard Norwegian Cruise Line’s newest ships that are designed for one person only. Oceanview staterooms add a picture window and not much else: Entry-level rooms (Small Oceanview Stateroom) are 111 square feet, increasing to 206 square feet if you go for the top-of-the-line category. Tip: Some staterooms on Decks 3 and 4 have porthole windows, and some Deck 7 and 8 staterooms have views obstructed by the ship’s lifeboats. Suites come in three flavors (Junior, Owners, and Royal) and offer substantially more space, plus private balconies, separate living and sleeping areas, sitting areas, and mini-bars. Public areas & activities Getting around the ship is a snap, thanks to her small size and convenient forward and aft staircases and elevator banks. Most of the ship’s public areas start on Deck 5, with our favorite lounge the Schooner Bar. Royal Caribbean has given this watering hole an entirely new look, with two sections of seating bordered by nautical window treatments and a polished wooden floor that weaves attractively through the room as the main passenger thoroughfare. The atrium, which rises up six decks, has been given brand-new LED lighting and is topped by a glass skylight and bookended by two glass elevators. The ship’s early ’90s roots shine through with the sheer number of mirrored surfaces, but overall this space looks pleasantly modern, and serves as the social hub of the ship. Evening production shows are held in the two-story Royal Theatre, while Boleros, situated at the stern on Deck 6, offers up a decently sized dance floor and Latin-infused live music. It functions as a sort of secondary show lounge, and features contemporary decor that wouldn’t look out of place aboard the line’s new Anthem of the Seas. The ship also has a completely restyled casino that’s pleasantly small (and easy to avoid if you’re not interested in gambling), shops featuring all the usual logo-brand and duty-free items, an arcade, a small Internet cafe, a nice library, and the iconic Viking Crown Lounge, which assumes its perch up on Deck 10 and offers some pretty spectacular views. Also on Deck 10 you’ll find a single swimming pool and three hot tubs located amidships that are small but adequate for a ship of this size. Don’t expect much from the onboard spa: Tucked into a corner on Deck 10, it offers the usual massage treatments and salon services but not much more (you won’t find any sprawling hydrotherapy pools or thermal suites here). Royal Caribbean’s trademark rock-climbing wall is located all the way aft on this deck, and one deck up on Deck 11 is a small fitness center that has weights, treadmills, elliptical machines, and some great views from the floor-to-ceiling windows. The ship also features a wraparound Promenade Deck that doubles as a jogging track during certain hours. Dining You won’t find hundreds of different dining options aboard Empress. But Windjammer Cafe, which wraps around the entire forward portion of Deck 10, has superb views, not to mention buffet breakfast, lunch, and dinner. The Main Dining Room is a two-story affair with more stellar views from its 180 degrees of panoramic windows. Breakfast, lunch, and dinner are served here, and Sunday brunch is offered (paradoxically) every day of the week, complete with a complimentary mimosa or Bloody Mary. Chops Grille, Royal Caribbean’s signature steakhouse, is located on Deck 5 and comes with a per-person surcharge of $39 per person.